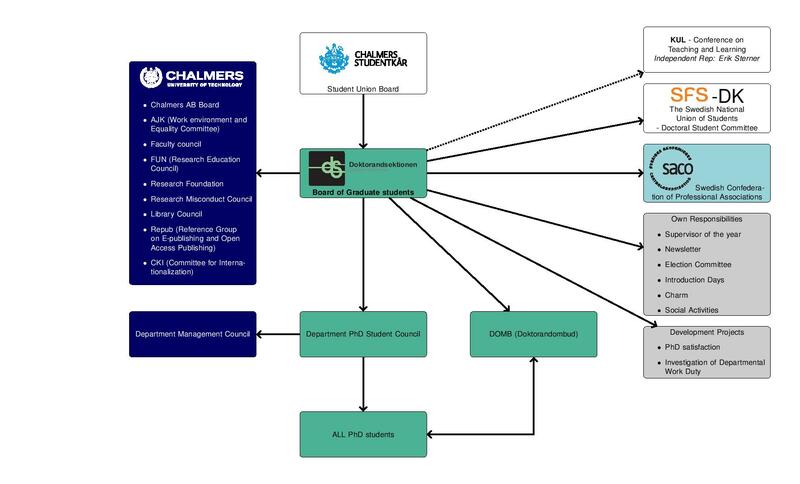 The Chalmers Board of Graduate Students is the coordinating mechanism between PhD students at all Chalmers departments. It represents the PhD students’ interests in several key boards and committees at Chalmers (including the Board of Chalmers AB, the Faculty board, the Research Education Committee, etc) and outside of Chalmers (the Swedish National Union of Students and the Doctoral Student Committee). – becoming a hub for doctoral students. The governance of the Chalmers Board of Graduate Students is divided upon three bodies: the governors board, the executive board and the PhD council. All the powers of the Board of Graduate Students are vested in the Governors Board and consist of all PhD students at Chalmers University of Technology. According to the regulations at least one Governors Board meeting is to be held each calendar year. Usually there is one spring meeting and one autumn meeting. This board is the executive group at the highest level and consist of PhD-student representatives from the different departments. At the departments with an active PhD Council, the PhD-student representative is elected by respective council. For the other departments the PhD-student representative is elected by the Governors Board of Graduate Students. The PhD Council is the executive group at the local level. The executive group consist of elected PhD students from the respective departments and takes part of the local activities at the department. Normally one of the PhD students in the PhD Council is also a member of the Board of Graduate Students. This is to increase the flow of information between the local and the central level. Chalmers Student Union is an independent non-profit organization, operated by and for the students at Chalmers. Although it is no longer compulsory by law for for all students in Sweden to be members of their respective student unions, it is still compulsory for all students (including PhD students) at Chalmers to be members of the Chalmers student union. For more information, please visit Chalmers Student Union.